Mirror, mirror - who's dat? Its a new moon in Pisces. Today. Actually, tonight at 11:59:38 pm. Interestingly, its at the last minutes of the day, the last day of the month, and Spring is right around the corner.......(YOU WILL BE SAVED. Jupiter is trining the new moon exact!). However, spring will have to wait. First there is some dissolving that has to be allowed. Some oneness waiting to be experienced. Some magical goodness of the world to be embraced. Some letting the ego -go and allowing the emotional giving to flow on down ! (I think of Bob Barker saying "COME ON DOWN" "LET's MAKE A DEAL.").... this could be fun you know! Right now the energy is about going to the inner cave of the heart and exploring the emotions that you find there. Got some blocked arteries? Don't we all ! What blocks your peace, love, contentment? I am sure without doubt.....its the MIND. It's what tape you are feeding yourself. SILENCE THAT TAPE. PUT IT ON HOLD. You will have help putting it on hold - as Mars (motivator) and Saturn (foundation) are about to station retrograde (slam on the brakes, stop the train, permit denied, etc). This will help you to look deep inside yourself for what it is that you wish to do, build, and what kind of foundation you TRULY need to feel secure and complete. And yes, 'other' is part of this. Mars is in Libra. Libra is about compromise. I look into your eyes and see a soul- that soul is tied to the universe- since i am also tied to the universe- wow we are flying on the same air wave! cool! This can be experienced in art, with another that is close to your heart, with divine, with a cause you believe in. BUT FIRST YOU MUST BELIEVE IN YOURSELF. YOU MUST LOVE YOURSELF. (at least a little!). This new moon is about FAITH. About the POWER OF FAITH. About how we see the divinity is the everyday movement of life if we chose. About showering ourselves with love and creative energy and then when the cup over flows sharing it with those that come into contact with us. ITS about counting your blessings. If you are reading this - you have several- you have eyes to see. you have a computer to read the blog, and thus Internet access. you have time to read it. You have the awareness of astrology and how it can give guidance in the mundane world. It's a blog written for free! That's a lot of blessings right there alone. Take that excerise and apply it to many areas of your life, and suddenly- wow......the world IS BEAUTIFUL. 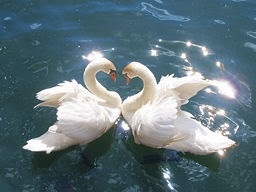 Did you know Swans mate for life? EVEN if you don't have a 'mate' you always have divine. THAT can be your partner that guides and leads you to the 'still waters'........Mars in Libra is about 'searching' and learning how to build partnership. We do need each other here on planet earth. We need the compassion and mercy of each other just to get through LOS ANGELES TRAFFIC! Think about it. What if everyone on the freeway was just - me-me- me. No manners. No allowing that car to come in from the off ramp.......shesh. we'd all be stuck on the pavement 'till the end of time; GOING NOWHERE. The same is true of life. YIELD a bit here and there with your me-first energy and watch the magical heart open. Of yours and others. MERCURY is now GOING DIRECT MOTION! Let the presses run ! It will take a few weeks for it to move out of its shadow (the degree mark that it went retrograde on)- March 20th to be exact. But you can still start the moving that you might of put on hold - of projects, etc. New clarity will come to add to these in the next weeks. Mercury has been in a great relationship with Mars all this time and that will continue. So plot away. IF Mars being retrograde blocks some ideas, see it as a gift instead of a hassle. If Mars questions the thinking process you are currently working with- also see that as a gift. The retrograde periods are GIFTS to re-work- re-think- re-do. THINK of it as a 'run-through' before opening night. From March 18th- until the 27th Mars will be 'triggering' the upcoming Lunar Eclipse (in April) and the Lunar Eclipse of Oct 2013. That means what was promised then and what is promised in the future dealing with partnerships is activated. Also- weather (extreme) will also be in the news. BALANCE is the key. The world is needing much more balance in our greed, treatment of mother earth, and in how we SHARE. Its a repeated theme- how we partner, what makes partnerships work, why they don't when they end. Did you LEARN something by that broken partnership? Takes two to merge- Takes two to argue and you know you can always do a 'take two' and work it out. But if you are lazy and you don't like to work...........well - you picked the wrong planet to visit- coz we be workin' it here, baby! Oh, yeah that brings me to the 'passive-agressive' energy of Mars in Libra. It will be in full motion until mid-July, but especially under-cover from here on out. We'll have help in the area of Jupiter going direct on March 6th - THANK THE LORD. And you can with steady work at developing patience toward your less evolved fellow humans. Jupiter and Saturn will be in a lovely relationship will trine exact on May 24th. Mark that as a 'goal date'.......meaning - set before yourself a task that furthers your objectives in life. Move toward that goal from now until end of May. Maybe its reducing debt, maybe its building a new habit - such as POSITIVE THINKING. Just set the goal. That's how you develop self -confidence. And Jupiter is all about belief. Saturn is about building. Working together - Jupiter and Saturn are hope and skill. Cheerfulness and hard work. Smiling while you tow that barge- knowing the paycheck is coming. The flow of life happens with our help or not. The river will move- that's its nature......wanting to return to the source. We too, are moving along a path toward the source. ALWAYS. When you look into the mirror you know how you've lived your life not by how many wrinkles you managed to cover up, zap away, etc. but how you 'feel' when you look INSIDE yourself. When you look at another do you see the love of your very self?